First of all, let me introduce myself: My name is Melissa, I am 27 years young, 6 feet tall, a beginner surfer, an average dancer, but an expert foodie (name a food I don’t like and I will give you a buck). I began my journey with travel2change about 18 months ago when I interned with them during my years in graduate school. I will admit it: I started this internship because it counted as course credit. What I did not expect was for it to grow to become such an important of my life. Like most of you, I love to travel. Who doesn’t, right? I wouldn’t quite claim to be a minimalist (although on most days I secretly aspire to be one). I like nice things. 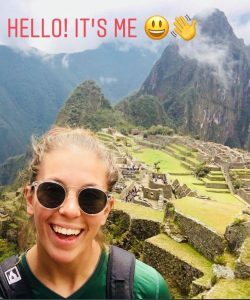 But when I travel, I have never been much for the “all inclusive traveling.” I mean, I am the type of girl who will risk becoming mortally sick to try one of those empañadas an old lady in some small town in Peru is selling from her little cart. After all, it might just turn out to be the best empañada I ever had! Back to my point… You don’t have to live under a rock and be able to pack your whole life in a backpack to live “true to yourself.” In today’s day and age, this is nearly impossible. And frankly, I don’t even think I would want to do this if given an ultimatum? With travel2change, I have found a different way of being true to myself. I have found a way to travel and to feel I give back with a greater sense of purpose. You guys, I am so excited to tell you that I will be leaving for Pohnpei, Micronesia, and Majuro, Marshall Islands on Wednesday! 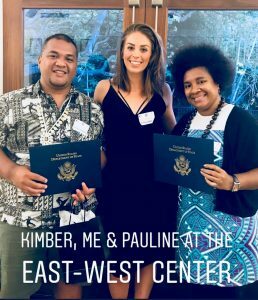 This spring, we were so fortunate to work with Kimber and Pauline, two fellows we had interning with us through the 2018 Pacific Islands Tourism Professional Fellow Program administered by the East-West center at University of Hawaii. This program was established to promote mutual understanding, enhance leadership and professional skills, as well as building lasting, sustainable partnerships between the U.S. and the different Pacific Islands. I feel so lucky to be going to both Micronesia and the Marshall Islands to continue this beautiful friendship with people who also feel passionate about creating positive impacts and doing so in a fun way! I am beyond excited for three busy weeks with lots of information sharing, learning opportunities, workshops, sustainability projects, and cheekbones that hurt from smiling so dang much. Stay tuned, my dear blogger friends: You are in for a sweet ride.